At BetterBody Foods, we believe making better food choices contributes to a happy and healthy life. We are committed to providing the best organic and natural foods for cooking, baking, health and wellness. Our goal is to teach our customers about how to use these revolutionary products to make powerful and healthy changes in their lives. We want to help you live life to the fullest. From our BBF family to yours, enjoy health and happiness. BetterBody Foods LIVfit™ Superfood Blend is the ultimate superfood! It is an incredible combination of fruits, vegetables, vegan proteins, prebiotics, B vitamins and fiber that have been shown to enhance muscle mass, increase energy, improve cognitive function, encourage digestive health, boost the immune system and fight off aging oxidation of cells in your body. Simply add a scoop to your morning shake, smoothie, juice, yogurt or cereal for a quick nutritional boost. Use LIVfit™ Superfood Blend in your favorite recipes, whether baking, making pancakes or creating your own power bars. It mixes well in a blender or hand shaker and is flavor neutral. Use DAILY for convenient, super nutrition! 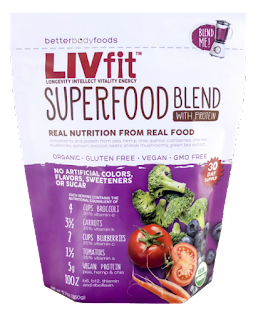 BetterBody Foods LIVfit Superfood Blend is a terrific way to get some super nutrition into your day! I love how complete it is! It's also flavor neutral so there's no funky taste to ruin your smoothie. I also love that it's organic. My favorite way to use BetterBody Foods LIVfit Superfood Blend is in my morning smoothies. It gives me tons of energy and keeps me healthy. I cannot say enough about this product! I absolutely love it and all the benefits it offers! 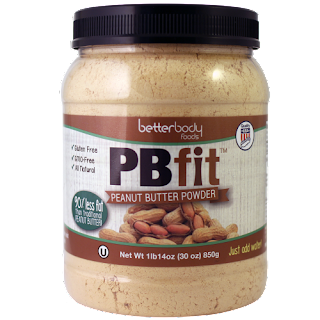 PBfit is a delicious, low fat powdered peanut butter made from gently roasted peanuts. We extract about 85% of the oil from the peanuts and grind them to a powder. We add a pinch of sugar and a dash of salt to create a delicious powder that is chock full of flavor. Combine PBfit and water for a healthy peanut butter spread that is one third the calories and 85% less fat than traditional peanut butter. PBfit makes a great dip for apples, bananas, celery and pretzels. Throw a few scoops into your smoothie, yogurt or oatmeal to add a flavorful protein boost. You can also replace some of the flour in your baked goods to make PB muffins, pancakes and brownies. As a huge fan of peanut butter I'm in love with PBfit! PBfit is full of flavor and tastes just like peanut butter but with much less fat. You can add water and make a creamy peanut butter or use it in recipes and everything turns out with a wonderfully delicious peanut butter flavor. Using PBfit in recipes is my favorite! It makes some Amazing peanut butter cookies and I feel less guilty about eating them because they have much less fat. 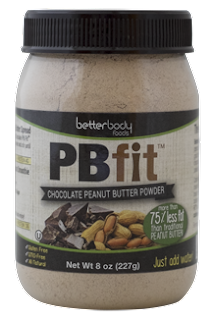 Chocolate PBfit is a delicious, low fat chocolate powdered peanut butter made from gently roasted peanuts. We extract about 85% of the oil from the peanuts and grind them to a powder. We add a scoop of premium cocoa, a pinch of sugar and a dash of salt to make this chocolate version of our classic powdered peanut butter. Combine Chocolate PBfit and water for a healthy spread that is more than 90% less fat and calories than other chocolate nut spreads. Chocolate PBfit makes a great dip for apples, bananas and pretzels. Throw a few scoops into your smoothie, yogurt or oatmeal to add a flavorful protein boost. You can also replace some of the flour in your baked goods to make chocolate peanut butter muffins, pancakes and brownies. Chocolate PBfit is so good! It satisfies my chocolate cravings and it makes a healthy additive to many recipes! I love throwing a scoop or two in my morning oatmeal or my protein smoothies to liven them up. This is a wonderful product! Naturally refined coconut oil comes from dried coconut meat and is one of the healthiest oils in the world. We never use chemicals during extraction in order to provide you with the purest, most natural oil available. Full of MCTs, aka “good fats”, naturally refined coconut oil is an immediate source of energy. Coconut oil is cholesterol-free, making it a perfect substitute for butter or margarine in cooking and baking. Naturally refined coconut oil is one of the most versatile oils around because its neutral flavor and aroma will not change the flavor of your foods. It can also be heated up to 425°F, which makes it a perfect choice for high heat stir fries, searing and deep frying. It’s antibacterial and antifungal properties keep you healthy from the outside in. It can be used as an all-natural moisturizer for your skin and hair and makes a great makeup remover, natural sunscreen and shave oil. 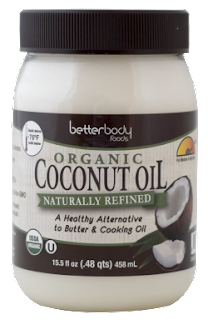 BetterBody Foods Organic Naturally Refined Coconut Oil is a wonderful way to add some healthy fat into your diet! I love to substitute this for butter in baking and have been amazed at how moist and delicious it makes my baked goods! Coconut Oil has so many uses and some of my favorite are using it on my skin as a moisturizer, shave oil and for removing my makeup. It's a wonderfully versatile product! Extra virgin coconut oil comes from fresh coconut meat and is one of the healthiest oils in the world. We never use chemicals during extraction in order to provide you with the purest, most natural oil available. Full of MCTs, aka “good fats”, extra virgin coconut oil is an immediate source of energy. It’s also cholesterol-free, making it a perfect substitute for butter or margarine in cooking and baking. Extra virgin coconut oil is one of the most versatile oils around and is ideal for medium heat cooking (up to 350°F). Its light coconut flavor and aroma make an excellent addition to cookies, brownies and stir fries. It’s antibacterial and antifungal properties keep you healthy from the outside in. It can be used as an all-natural moisturizer for your skin and hair and makes a great makeup remover, natural sunscreen and shave oil. 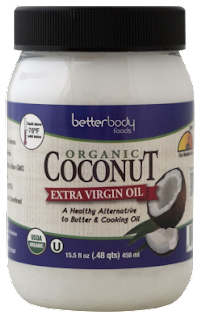 BetterBody Foods Organic Extra Virgin Coconut Oil a wonderful product! Perfect for baking or for using in your beauty routine! I love that it's a wonderful way to add healthy fat to your diet and I always find that I have more energy on days that I consume it. I also love the flavor that it gives my baking! Chia was the ancient Mayan word for strength. This powerful little super seed makes you stronger by supplying the vital building blocks of nutrition. Chia is jam packed with protein, omega-3 fatty acids, fiber and calcium. It also offers essential vitamins and minerals including manganese, magnesium, phosphorus, zinc, B vitamins and potassium. Add chia to your smoothies or juice to help keep you feeling full and hydrated. Sprinkle on yogurt, salads and cereal to add a nutritious boost to your meal or snack. You can also use chia in cooking and baking. Add a few scoops to your favorite muffin recipe or use chia as a great egg replacer. Mix 1 tablespoon chia with 3 tablespoons water and let sit for 5 minutes to create a gel that replaces 1 egg. 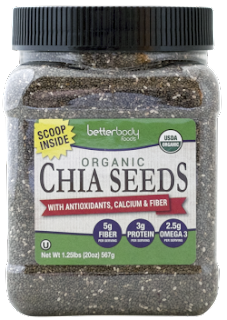 BetterBody Foods Organic Chia Seeds are so good for you! They are packed with protein, omega-3 fatty acids, fiber and calcium. These are terrific to add to foods to help you feel full and boost your nutrition. I love using BetterBody Foods Organic Chia Seeds as an egg replacement! I can't even tell you how many times I've been craving cookies and begun to make them only to realize that I'm out of eggs. The solution is always my BetterBody Foods Organic Chia Seeds. I also love the little added crunch they give my cookies. Quinoa is an ancient grain grown in the Andes Mountains of South America. Our blend of white, red and black grains is the perfect combination of taste, texture and nutritional benefits. 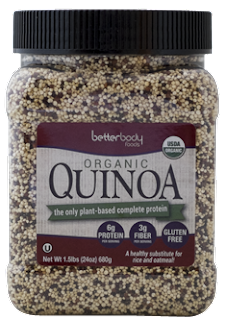 Quinoa is only complete plant-based protein, meaning it contains all 9 essential amino acids. One serving has a whopping 6 grams of protein. Use quinoa in place of rice, couscous or other grains. It is delicious paired with roasted or stir fried vegetables. The darker grains have a nuttier flavor and slightly crunchier texture that make our blend perfect for salads and hearty soups. Start your day off with a bowl of quinoa and fresh berries to give energy and keep you satisfied until lunch. BetterBody Foods Organic Quinoa Medley makes a beautiful side dish! I absolutely love the color of this Organic Quinoa Medley! It also is so good for you! It contains a whopping nine essential amino acids, and six grams of protein per serving. I love making this instead of rice because it's much healthier and tastes so yummy! Coconut flour is a gluten free, low glycemic alternative to wheat and grain flours. It is made from ground coconut and retains some of the healthy coconut oil. Coconut flour is 60% dietary fiber (5 g per serving), making it perfect for low carb and paleo diets. 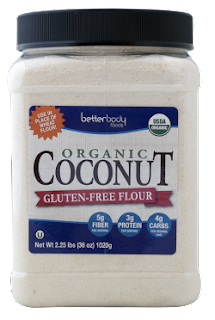 BetterBody Foods Organic Coconut Flour is perfect for your low carb and paleo diets! I love the light coconut flavor and really enjoy this Organic Coconut Flour for making muffins. They turn out perfect and taste delicious! Agave is a natural, low glycemic sweetener that comes from the nectar of the agave plant. Most companies process out the natural fiber (inulin) from the nectar. However, our agave retains the naturally occurring inulin, making it a more satisfying sweetener. Agave is a total sugar replacement. It is 1.5-2 times sweeter than white sugar, so you save calories by using less. Use agave in place of sugar, honey or syrup in all of your recipes. It also makes a great sweetener for coffee, tea and lemonade. Drizzle agave on your oatmeal, plain yogurt and pancakes for a healthy and natural start to you day. BetterBody Foods Organic Agave is the perfect sweetener! I love the sweet flavor of this Organic Agave! It's sweeter than white sugar so you can use less and save some calories, which I'm a huge fan of. I love using this in my coffee, tea and lemonade. I find it less messy than using sugar and love that it's low glycemic and all natural. Coconut palm sugar is a naturally delicious sugar that comes from the nectar of the flower that grows on the coconut tree. It is a healthy, low glycemic replacement for white and brown sugar. This delicious sweetener also contains amino acids, potassium, magnesium, iron, zinc and B vitamins. Coconut sugar is considered the most sustainable sweetener in the world by the Food and Agriculture Organization, producing 50-75% more sugar per acre than sugar cane. Use coconut sugar to add a rich, caramel flavor to all of your recipes. It’s a simple 1 for 1 replacement for white and brown sugar. It also makes a delicious topping for oatmeal, quinoa and other breakfast cereals. 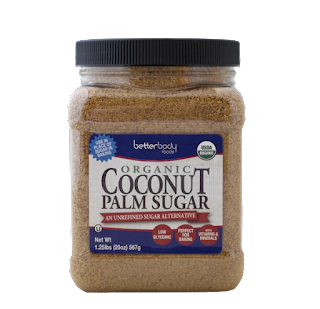 BetterBody Foods Organic Coconut Palm Sugar is wonderful! I love that it's low glycemic and works wonderful in all my recipes. It contains amino acids, potassium, magnesium, iron, zinc and B vitamins. My favorite use for Organic Coconut Palm Sugar is in my homemade granola energy bars. It's the perfect amount of sweetness and works well in all my recipes. Organic Madagascar Bourbon Vanilla is the finest quality vanilla in the world. Cultivated on the remote Isle of Bourbon in Madagascar, it has a sweet velvety flavor with floral undertones. Use Organic Madagascar Bourbon Vanilla in all your favorite recipes. Its delicate aroma adds a beautiful fragrance to homemade lotions, scrubs and air fresheners. Organic Madagascar Bourbon Vanilla is perfect for aromatherapy uses as well. BetterBody Foods Organic Bourbon Madagascar Vanilla is amazing! I absolutely love the flavor of this vanilla and feel that it really gives my recipes an amazingly wonderful flavor! It smells heavenly and has many uses. This post is very nice. Thank you for sharing this informative post. All the things are very healthy. These are very delicious too.